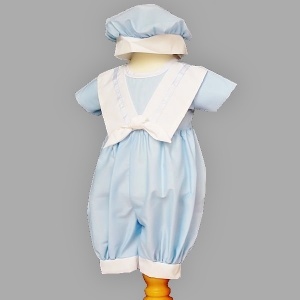 Baby boys blue sailor style christening romper and hat, perfect for your little baby boys christening day. Romper: Blue poly cotton romper with a white sailor style collar and tied bow, short sleeved, zip fastening on the back for easy removal / changing. Hat: Matching blue and white sailor style beret hat, elasticated for the perfect fit. This 2 piece designer christening romper outfit is UK made and designed by the exclusive christening designers Eva Rose. The quality is outstanding and will make a precious family heirloom for future generations of your family. Brand new complete with tags, hanger and a clear cover bag to keep the outfit in tip-top condition. Lovely outfit and quality at a bargain price. Fast delivery, great company to deal with.